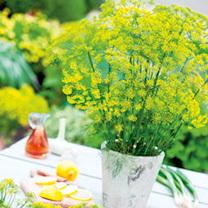 With their strong, tasty flavour, dill is an essential ingredient for any keen chef. Shop the range of dill seeds online at Dobies of Devon and grow your own at home. Dill seeds are not only a great way of cutting the cost of your food shopping: growing them can be incredibly rewarding. It’s simple and easy to do, so place your order today! We have more herb seeds in stock too, including basil, fennel and cress.